The arizona temple was wonderful. A little hot but wonderful. we look a little funny in this picture Im not sure we were quite ready. I had never seen a cactus garden before, but I thought it was super neat. We went to Arizona on the 26th of October for the nelson family reunion. It was acutually a reunion for Matts dad's(verne) siblings. Matt comes from an incredible line of people. I really love his family. It was neat to meet Matt's Uncles and see his Aunt Clara again. Matt's dad is the youngest in the white shirt. it was a really nice reunion. Matt's dad recited to "the race which always makes me cry. He knows the entire thing by heart and I always get emotional when I hear him. Olivia was so good sharing her books with her cousins. actually these are her second cousins thier parents are her first cousins. believe it or not I am a great aunt. Matts parents have 15 great grandchildren which means Matt and I have 15 great nieces and nephews. crazy huh? Our sister in law Marie is expecting a little girl at the end of december so she will at least have one cousin on her dads side close to her age. we are exited about that. This was Olivias best friend in Arizona. Ellie took such good care of her. 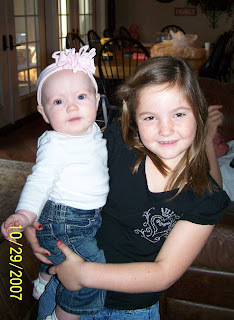 This is actually Olivias closest cousin on Matt's side and they sure loved playing together. She even got to have her very first tea party.